I made this for my Mom's birthday this year which was June 24th. I started to come down with a cold the Thursday before and hadn't made the card yet! I felt well enough to make this card Friday night, so when she came over Saturday the 23rd it was ready to give. But by then I was in the throws of a huge virus. YUK. I felt awful, not only from the cold, but also because I couldn't take her out to dinner for her birthday. She spent the day taking care of her sicko daughter. What a bummer, for both of us. I finally am well enough to post it. I just love Perfect Plum, Pale Plum, and Mellow Moss together. I used the puffballs on a stick stamp from Happy Harmony, inked them up with the Perfect Plum, Pale Plum, and Mellow Moss markers, and stamped them on Whisper White cardstock. I punched it out using the Mega scallop oval punch, and mounted it on a Giga scallop oval punch in Perfect Plum. 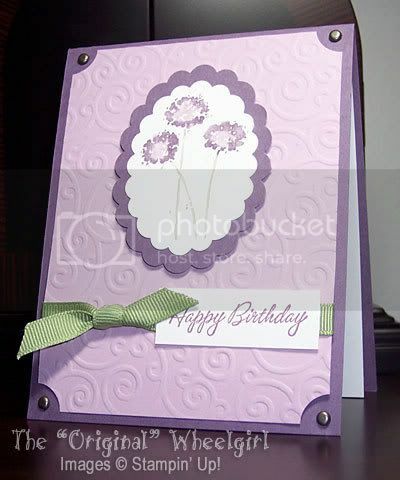 The background is Pale Plum, which was Cuttlebugged using the swirly texture plate from Fiskars. It is more subtle than the Cuttlebug folder. I ticket cornered it and tied moss grosgrain ribbon around it. The sentiment is from Warmest Regards in Perfect Plum, and attached on top of the ribbon. The focal image is attached with dimensionals. I added pewter brads to the corners to finish it off. 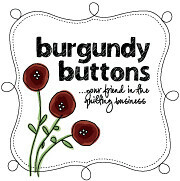 Just came across your blog today and have to tell you how much I like your cards. They are so clean and elegant looking. Wonderful! I will visit often. wow! these cards are an inspiration.